Andreas Pichler is a very artistic guy, he has come up with a new innovative finishing process that is completely and very distinctly European. I don't know if they will appeal to Americans due to the Euro Avante Garde appearance. I think that probably they will be highly collectible. The quality fit and finish is impeccable. The Andreas guitar line was one of the guitars that got pulled off my Worlds Best Guitar page. When I first bought the line I recognized immediately some of the problems. However I had been making excellent progress with the sales manager. I was pretty sure that he was going to make the necessary changes. The body shape was very hip and very comfortable. Then the company hired some Jibroney as a new sales manager. Dino Ferreri, He was completely unresponsive to me, In fact we had a strong personality conflict. I also requested Korina & Swamp Ash Bodies, He did not comply. I indicated to them that the pickup mounting was substandard to what people are expecting on a modern guitar, He did not comply. The company also wanted to use solid maple bodies. "80's anyone"
The maple body was incredibly shrill sounding. especially when coupled with that aluminum fingerboard. The aluminum fingerboard is actually very cool, I even liked the sound of it on a model that we custom made with a Korina body. Andreas finally dumped the moronic sales manager but too little too late... Because the damage had been done. Within less than a year this Jibroney had put them out of business. Wow! Certainly not your typical Strat body here. The first impression of the Andreas Shark Guitar is that of amazement. It is refreshing to witness a design and finish that I personally have never encountered before. The most obvious detail of this guitar is the body shape. It is easy to understand why this model is named the Shark, with its fin shaped rear body contour and hockey stick style headstock. Way cool chrome pickup rings with the rear ring extending around the bridge in the same ergonomic shape of the body contour. Chrome hardware including two Tele style knobs for volume and tone recessed into the body. Five-way Strat style pickup selector switch, six on a side Gotoh chrome Machine Heads, chrome Wilkinson fixed style bridge with string thru body design. The screws used to adhere the pickup rings to the body as well as the pickup cavity plate and the bolts on the neck are hex screws. A small thing yes, but classy and very unique. This Shark model sports two custom humbuckers in black, hard rock maple neck and Alder body. But these amenities deserve special attention. The Shark sports a Hard Rock Maple neck, 22 fret, 25.59 scale, bone nut with a classy red Infeld stripe that extends the length of the neck directly under where the "B" string would lay. This really is a classy touch. 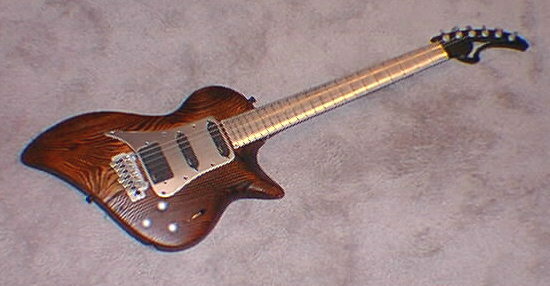 Unique hockey stick contour headstock with six on a side chrome Gotoh tuners, medium jumbo frets and a bolt on neck. This combined with the hard rock maple board provides a spanky cutting tone. The neck is of medium thickness and has a great rounded Les Paul Classic feel to it, Les Paul players will love it, Strat players certainly will not be scared off because this neck lies somewhat right in the middle. Very comfortable. Here is where the rubber hits the road, literally. The Sharks ergonomically shaped body is one thing, and the soft coat finish is ground breaking. 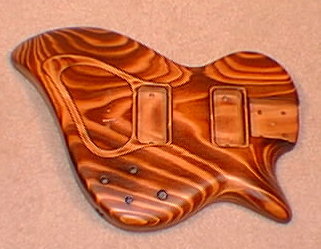 The actual body of the Shark is Alder, however H onduras mahogany is also an option. The body and matching headstock are covered in the Andreas patented "soft coat finish". The soft coat is a revolutionary latex rubberized finish that covers the entire body and headstock. I'm tellin' ya, it's really cool and something I've never seen before or felt before. This particular model is royal blue, but is also available in red and black. The soft coat finish combined with this incredible carved body and unique body shape, certainly ensures the uniqueness of this instrument. For testing purposes I will be utilizing a Mesa Dual Rectifier with closed back Marshall 4x12 cab with 75 watt Celestions, as well as my trusty Line 6 POD running directly into a Mackie 1604 out to a full range PA. As always testing remains at modest volumes to ensure as much sonic accuracy as possible. While my Rectifier warms up I always test a guitar for a few minutes acoustically and the Shark is no exception. Strumming the Shark acoustically is just the beginning of my treat. This guitar is a solid chunk of Alder and with a Hard Rock Maple neck, even acoustically this guitar spanks out the goods. Solid ringing tone with even tension across the neck spectrum. This guitar is set up flawlessly with low action and the intonation seems to be right on. My next step is to plug into the Dual Rectifier's dirty channel. With the pickup selector to the bridge position, the Shark sounds like the hunter that it is. Fat & Beefy with a really cool mid range cut. Makes me wonder what are these pickups? Andreas informs me that these pickups are of a custom made origin from Harry Haussel, who dat? I must admit I have not heard (literally) of these pickups until now and I am very impressed. Warm, creamy and a well-rounded spectrum with just enough mid range attack to ensure those leads are cutting through a mix. This particular model sports two humbuckers, but is also available in hum, single, single set up. Wired to a five-way selector switch to split coils in both humbuckers or to obviously run them separately or simultaneously. Just about any tone you want can be achieved with this set up. Overdriven in bridge position is killer, fat, BOOP DERE IT IS! Tone. Slicing through but not harsh. Neck position pickup is sweet, warm and bluesy with great balance and ringing sustain and it doesn't mud up. It certainly is inspiring to witness first hand cutting edge ingenuity in anything that you do. The Andreas Shark is an example of daring enough to be different but yet grounded enough to be traditional. With the uniqueness of the Shark body contour to its revolutionary soft coat finish, the Shark is one totally awesome guitar. The Shark is in no way a novelty item, this is a great playing, great sounding guitar capable of producing just about any tone imaginable. Manufactured in Austria and now swimming to the States, Andreas is now setting up limited dealerships in the USA and is now starting to ship. At a list price of $2,100, the Shark is not inexpensive but not outrageously priced either. For those who "Dare to be Different" and undoubtedly a welcome addition to anyone's guitar collection. The Andreas Shark is soooo cool it's scary! And just when you thought it was safe to go back in the water again! Even Though The Guitar Deserved A Good Review, the main reason they got one was because Andreas Was Advertising In This Publication. I never trust magazine reviews they are usually Advertorial rather than editorial. Sometimes they are right but for the wrong reasons. Just as you should never trust a car salesman, a politician or a televangelist!